A hearty bowl of warm oatmeal that’s infused with cinnamon is such a comforting breakfast, but I never budget the time for making hot cereal on busy weekday mornings. So I made cinnamon oatmeal bars instead. A half dozen ladies and I are throwing a virtual baby shower today for Krissy, who’s expecting her first baby, and I figured it wouldn’t be too cool to show up to a party, virtual or not, with a bowl of cold soggy oatmeal in hand. I thought these would be a bigger hit with the crowd. Aside from being being portable, they’re no-bake so there’s no chance of burning my mouth on one like I have a tendency to do with oatmeal. I’m always so anxious to dig in that I usually burn my mouth on those scalding little grains. 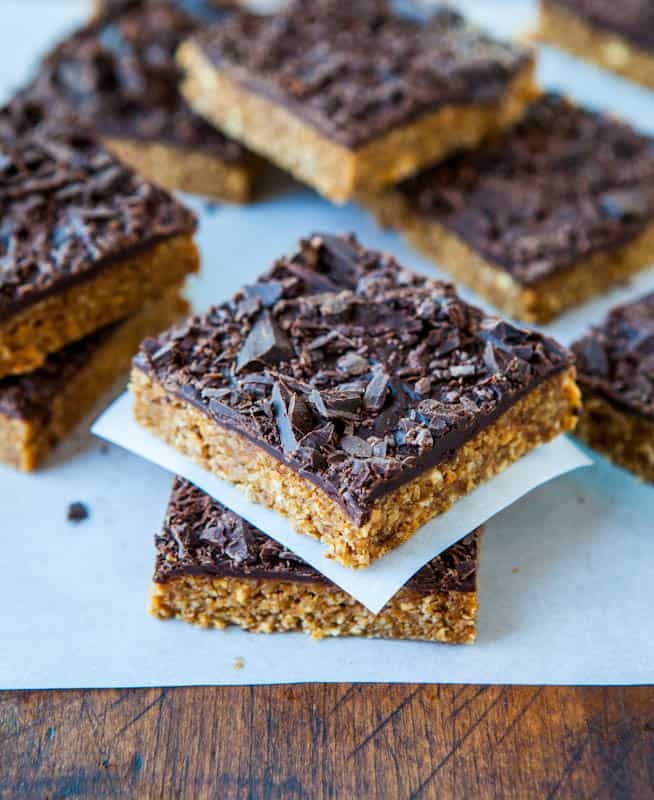 I made these bars with a healthy dose of peanut butter, and although it’s possible to swirl peanut butter into hot oatmeal, I find it gets a bit lost. 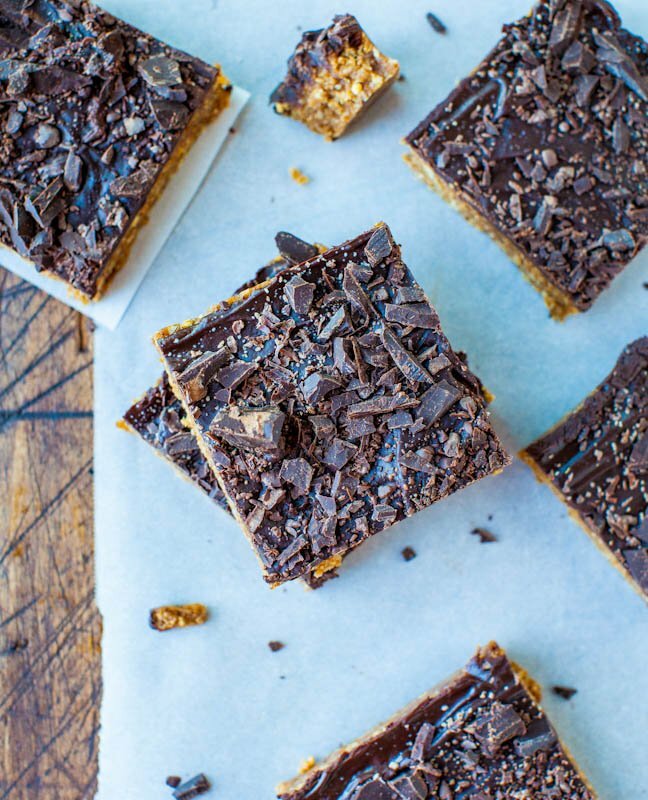 Although it’s not the most prominent flavor in these bars either, the cinnamon is; there’s a peanut butter undertone in just the right amount so that it doesn’t overpower the cinnamon or the dates, and instead complements them. There’s chocolate involved in two ways, too. It just wouldn’t be a party without it. After pressing the no-bake dough into the pan, I made a quick and easy chocolate ganache in the microwave and poured the silky brown elixir over the dough. Then I roughly chopped a 72% percent dark chocolate bar, a Pound Plus from Trader Joe’s, and sprinkled that over the ganache before it set up, trapping the irregular chunks in it’s sleek grip. Truthfully, I had no intention of adding chopped chocolate, but it’s hard to photograph a really sleek chocolate surface and after looking at that smooth ganache, I decided I didn’t want to struggle with chocolate glare since this was supposed to be a five-minute easy-breezy dessert. The chopped chunks turned out to be a happy accident because those dark little pebbles added both texture and an intensity of flavor that I loved. 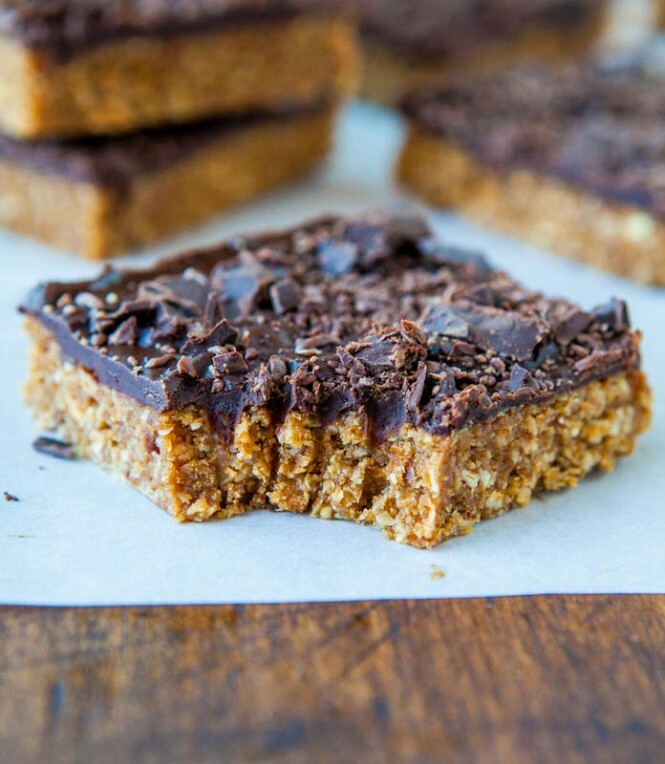 To make these bars, simply combine oats, medjool dates, peanut butter, agave or any of the alternate sweeteners suggested, cinnamon, and vanilla in a food processor or high speed blender and process it until it combines and clumps together. I recommend a food processor over a Vita-Mix or high speed blender for clean up ease, but use what you have. This dough needs to be able to hold it’s shape when pinched between your fingers or use an imaginary small marble test. If you can easily form one, your dough is on the right track. For example, look into the canister of the food processor where 6 o’clock would be. That big, shiny, smooth surface is a good sign because it’s indicative of dough that can easily be pushed into a pan and then sliced into bars with ease without risk of them crumbling or falling apart. If your theoretical marble crumbles and won’t stick together, the dough is too dry. Either add a few more dates, another dollop of peanut butter, or an additional squirt of agave and process again. Conversely, if your marble is loose and very squishy or limp, seemingly greasy or too soft to create a well-formed little nugget, the dough has too much moisture in it, likely from the peanut butter. Add another small handful of oats, which will dry out the dough, and process again. I find this issue to occur less than the first issue, but your mileage may vary. This is not an exact science, and you may need to play with your ratios by a quarter cup of something here or there, but the values suggested in the recipe will set you on the right track, likely with only minor tweaking necessary. The resulting bars are chewy and have tons of texture. For a texture junkie like me, they’re like hitting the texture lottery. The ground medjools and oats provided one layer of texture. The crunchy peanut butter, which I don’t usually buy but had some on hand, but used in the bars, added another level of texture. And the chopped chocolate bits on top added a third layer. Make sure your dental floss is handy after all that texture. 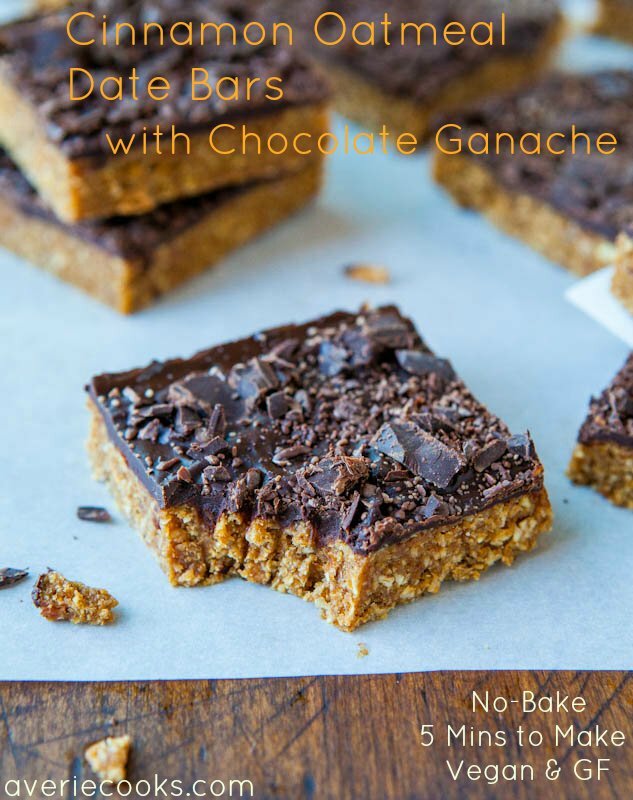 The bars are sweetened, but not overly so. 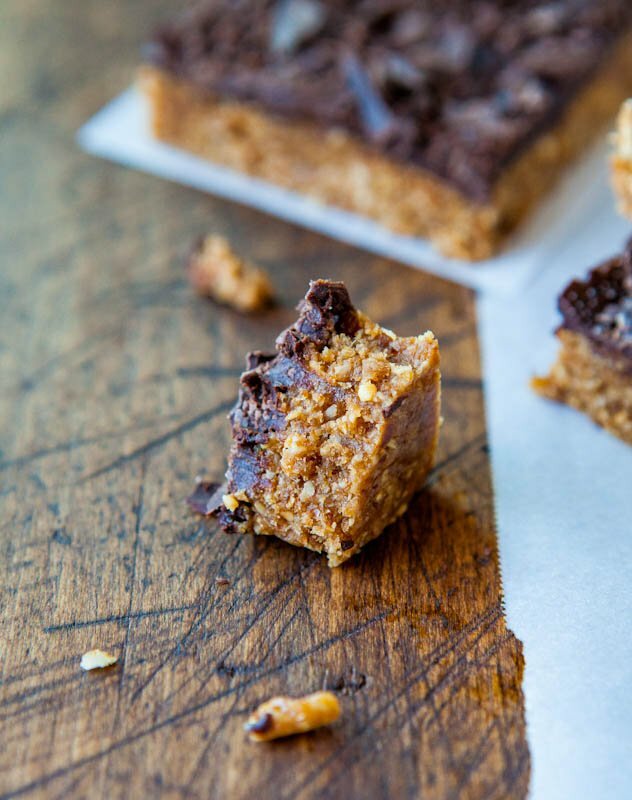 They really are a pretty ‘natural’ bar with no refined sugar used. 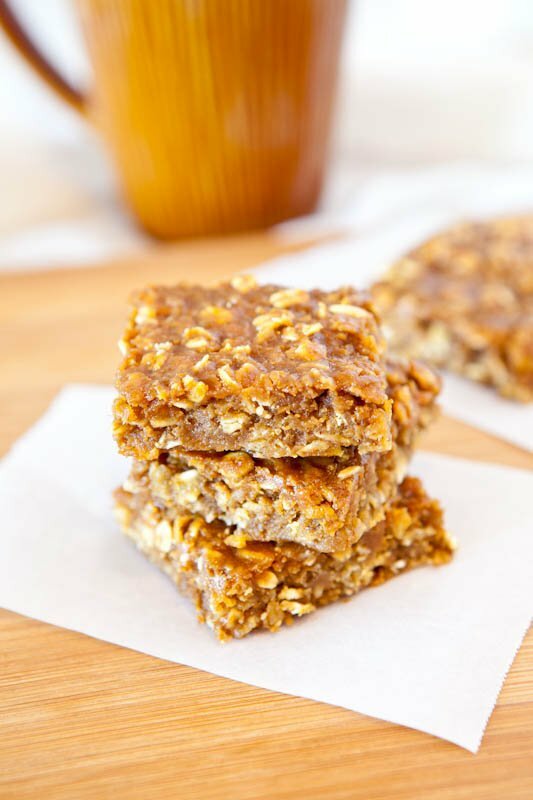 Agave or honey are my first choices for sweeteners because they do a great job of both sweetening and binding the dough, but brown rice syrup, corn syrup, or maple syrup will work. Maple, however, will both alter and mask some flavors much more so than the other syrups, and in this recipe, I preferred the cleaner sweetness of agave because I want the cinnamon essence to be prominent and unmasked. I’m really glad I didn’t have to bring these to an actual party and could keep them all for myself. See how I am. Line an 8-by-8-inch pan with aluminum foil and optionally spray with cooking spray; set aside. 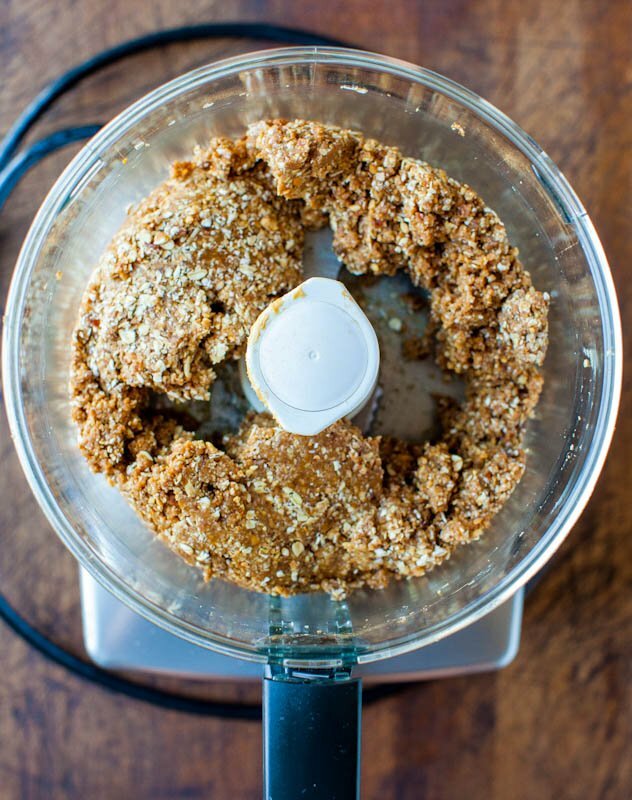 To the canister of a food processor or Vita-Mix (I used a food processor) add oats, dates (I used Trader Joe’s), peanut butter (I used crunchy), agave, vanilla, cinnamon to taste, and process until dough comes together. Dough will be dense and when squeezed between fingers, it should hold it’s shape, not fall apart, nor be crumbly. 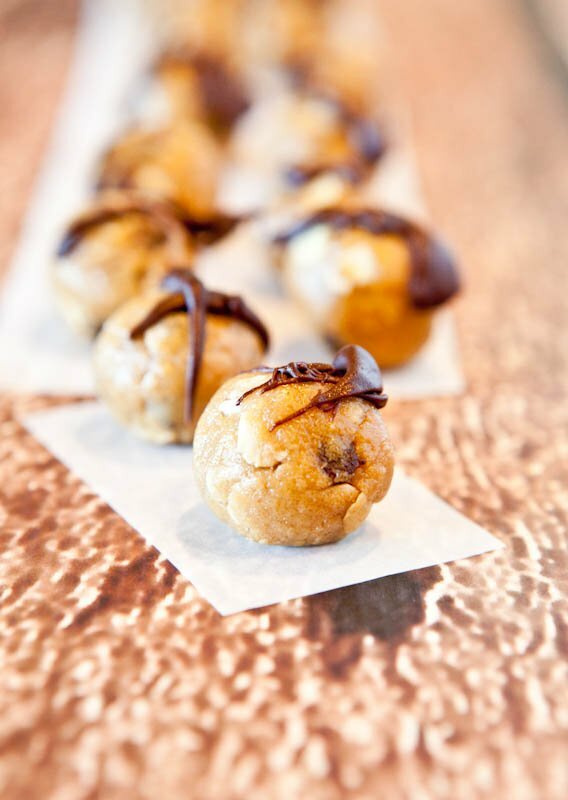 If dough is crumbly or you cannot easily form a marble-sized ball with it, it’s too dry and needs more liquid or a binding ingredient such as more agave, more peanut butter, or more dates in order for it to come together. If mixture seems too wet, is sloppy and loose, add more oats. This is not an exact science and you may need to play with the ratios of wet and dry ingredients, but the goal is a dough that is dense, thick, holds it shape, can be packed into a pan, and when sliced, will hold it’s shape in bar form. Press mixture into prepared pan, packing it down, pushing it into the corners, and smooth it with a spatula; set pan aside. For the chocolate topping: In a medium microwave-safe bowl, add 1 1/2 cup chocolate chips and heat on high power for 1 minute to soften them; set aside. In a small microwave-safe bowl, bring the cream or milk to a boil and it will happen quickly, in about 20 to 30 seconds. Pour cream over chocolate and let stand for about 3 minutes. Stir or whisk to combine and if chocolate is not smoothing out easily or combining, reheat mixture for 15 seconds or until it can be stirred smooth. Pour chocolate over the bars in an even layer, smoothing it with an offset knife or spatula. Evenly sprinkle and distribute the chopped chocolate chunks (I used Trader Joe’s 72% Pound Plus bar) over the ganache before it begins to set up. Place pan in the refrigerator for at least 30 minutes, or until chocolate sets up a bit, before slicing and serving. Bars can be stored in an airtight container at room temperature for up to 1 week, or stored in the refrigerator for up to 2 weeks, or can be frozen for up to 3 months. I prefer to store them in the refrigerator. 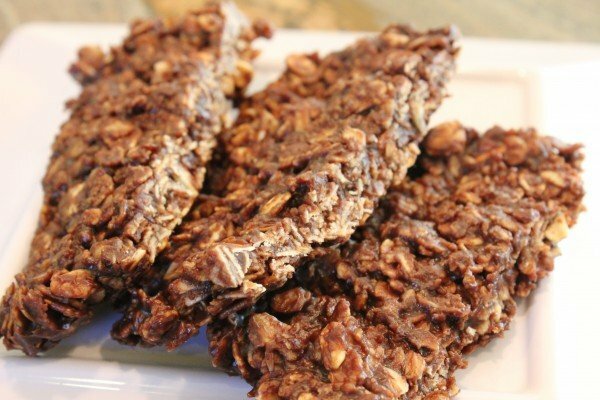 Do you make oatmeal frequently or use oats in your baking? I enjoy oatmeal but don’t make it much because we’re usually running late most mornings and there’s no time for it. where do you find “72% dark chocolate” bars, that tell you what the percentage is? Is that something specific to Trader Joe’s (we don’t have them here) or is that a certain brand of chocolate bar? Yes I find those bars at Trader Joe’s but if you do some online research you’ll be able to find what stores carry chocolate listed by percentages (it’s actually fairly common) and order accordingly. 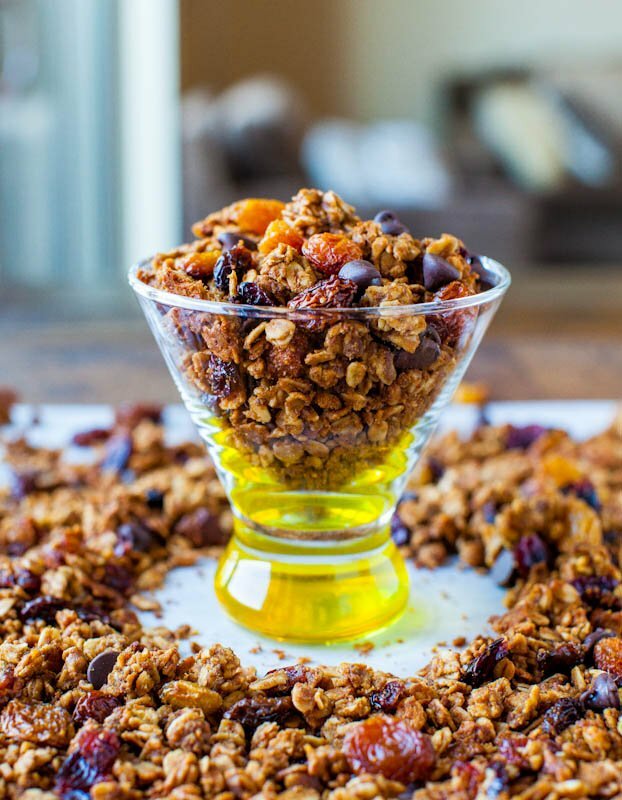 So I will likely save this recipe for a dessert/snack (as it was meant to be) rather than a quick, on-the-run breakfast (I realize that this recipe wasn’t posted as a breakfast bar and Google just picked up on key words). I think the ‘contains alcohol’ is referring to the vanilla extract…not sure why that’s a ‘bad’ point :). For the recipe I inputted, I used honey as the sweetener and natural peanut butter. As with other recipes I’ve made, when I use Kraft natural peanut butter, I have to use much less than the recipe calls for otherwise the end product is a little too loose. This is the first time I’ve been on your site…I’ve got it bookmarked so it certainly won’t be the last :)! Thanks for the info and glad you found my site!